Which Citizens Are Under More Surveillance, U.S. Or European? European leaders were outraged over revelations of NSA surveillance. But in many countries, wiretapping by law enforcement agencies is legal and privacy safeguards are weaker. Still, comparisons can be misleading. 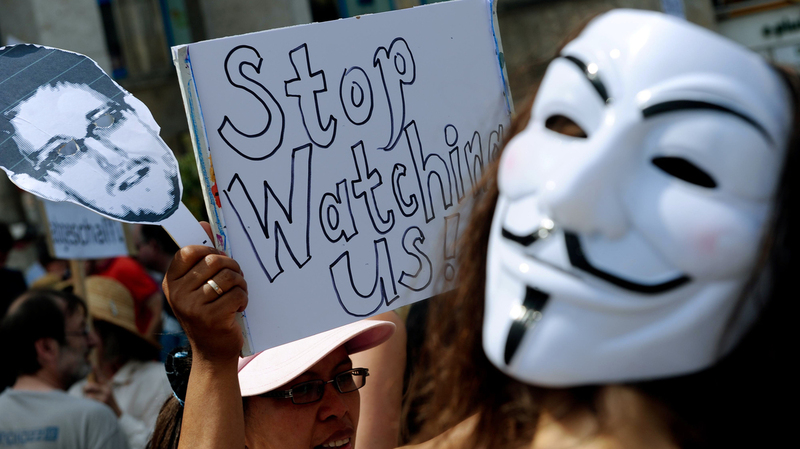 Which Citizens Are Under More Surveillance, U.S. Or European? Protesters demonstrate against alleged NSA surveillance in Germany during a rally in Hannover, Germany, on Saturday. The disclosure of of previously secret NSA surveillance programs has been met by outrage in Europe. The European Parliament even threatened to delay trade talks with the United States. Yet U.S. officials have dismissed much of the complaining as hypocrisy. Before the House rejected legislation that would have limited the data the NSA can collect last week, U.S. intelligence officials argued that regulation of government surveillance programs is actually tighter in the United States than in many other countries. Stewart Baker, formerly the NSA's general counsel, told the House Judiciary Committee this month that Europeans are more likely to be spied on by their governments than Americans are by theirs. And he had data to back that up. "According to the Max Planck Institute, you're 100 times more likely to be surveilled by your own government if you live in the Netherlands or you live in Italy," Baker said. "You're 30 to 50 times more likely to be surveilled if you're a French or a German national than in the United States." Those numbers are generally accurate, says Joris van Hoboken of the Institute for Information Law at the University of Amsterdam. But he points out that many of the surveillance orders are issued by police departments, not by intelligence agencies like the NSA. He cites his own country. "It's quite known that law enforcement in the Netherlands uses wiretapping to a great extent, and that has to do with a certain tradition in the Netherlands of using that instrument," he says, as opposed to using, for example, undercover agents. But U.S. officials also argue that the legal restrictions on surveillance are tighter here. Christopher Wolf, a lawyer specializing in privacy, recently co-wrote a study comparing the extent to which spy investigations have to get outside approval, in the United States and in Europe. His conclusion: For all the uproar here over intelligence agencies having a free hand, it's worse in Europe. "We can have a debate over whether or not the judicial and legislative approval process is working here in America, but the fact is, it exists, and in many places in Europe you don't have that kind of due process," Wolf says. "You don't have legislative oversight. In fact, the national security investigations are done completely in the dark or mostly in the dark." He cites Germany's Office of Criminal Investigation as an example. "It's permitted to use a computer virus to search IT systems and to monitor communications and collect data, without the knowledge of users or service providers," Wolf says. "And while a court order is needed to use it, the service providers often aren't even aware of its deployment." Van Hoboken, the Dutch information researcher, does not disagree that oversight is weaker in Europe. "It's actually true that in general the laws here that allow national security agencies and intelligence community to do wiretapping, there are less details and sometimes even less procedural safeguards," he says. On the other hand, van Hoboken says, it's a mistake to focus too heavily on comparisons between what the NSA can do and what European intelligence agencies can do. Intelligence activities in Europe are done by individual governments and on a far, far smaller scale than what the NSA does. And one other point: The laws that limit the NSA only apply to what the agency does with U.S. citizens on U.S. territory. "And so that oversight is basically quite meaningless from a perspective of a foreign country or people in a foreign country," where the NSA can basically do what it wants, van Hoboken says. So U.S. officials may bristle over some European complaints about NSA surveillance, but those European concerns are not entirely unfounded.